The 18th century writer and scholar, Dr. Samuel Johnson, had some very rude things to say about Scotland and the Scots, the most offensive being that “the noblest prospect which a Scotsman ever sees is the high road that leads him to England”, and,”Oats. A grain which in England is generally given to horses, but in Scotland supports the people”. 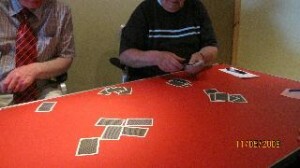 He did, however, show wisdom in the following statement:”I am sorry I have not learned to play at cards. It is very useful in life: it generates kindness and consolidates society”. The Whist Club, which meets every Monday from 8-10.30 p.m. at Breasclete Community Centre, certainly demonstrates these qualities. In addition, there is plenty of spòrs and fealla-dha to be had, among good company. Prizes of little value and scant usefulness are awarded for coming first and for coming last. And we have tea, biscuits, and, not infrequently, cakes or scones. The ability to play cards, or even to distinguish between hearts. diamonds, clubs and spades, is neither a requirement nor a deterrent to joining this doughty band. Not infrequently, people turn up protesting ignorance of the game who turn out to be hustlers, going home week after week with the prize. Everyone is welcome, from all airts and pairts, of all ages, of any level of ability. We play all year.